After last week's amazing shopping trip, I had hopes that maybe I had really gotten this shopping thing down right and I'd see nearly 90 percent savings every week. I guess I like to live in fantasy land. Compared to last week, my savings percentages weren't nearly as high this week. I did manage to score this Halo Mega Bloks set for The Boy's birthday for $1.74 after coupons! That's including tax! We teased him that I spent less than $2 for his birthday and he was completely surprised to open this gift! He was certain I'd gotten him something from the dollar store. I got a great deal on BBQ sauce at WinnDixie this week. It's not normally a store for amazing savings. But I got 12 bottles of BBQ sauce for free. Walmart also had a hidden deal...we bought 69 individual granola bars, nutrigrain bars and fig newtons for just 10 cents each! We've totally stocked up on snacks until school gets out, I think. 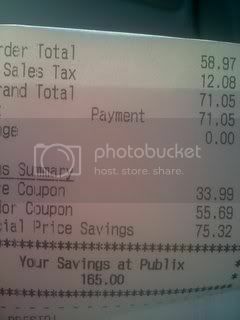 This week at Publix I had about 75 percent savings. That's not really anything to be disappointed. It made me realized that I'm probably getting spoiled with so many freebies. BUT, and this is important to remember, it's harder to score free items when the items are higher priced. 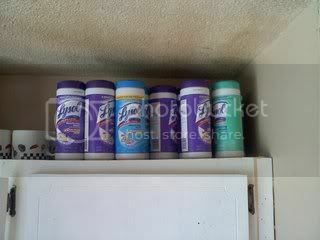 TWENTY bottles of lysol wipes, retail value of $40 for just $10! I'm really kicking myself for not dividing up my purchase on this trip. I had a $5 off total competitor coupon and a $5 off total publix coupon. IF I had split my transaction with just the wipes and the cooking cream together, with the coupons, my total cost would have only been $1 for 20 bottles of wipes and 8 Philly Cooking Cremes! The rest of my groceries would have been about $52 instead of $58. So not splitting my transaction really cost me about $6. It's a lesson learned for next week, though! If I think I'm going to have more than $100 in groceries, split it up for extra savings. Here's my receipt...$165 savings, $58 before tax. I had nearly $90 in coupons this week! Have you managed to find any of the new Publix coupon books in our area? Especially the one stop?